At last, the sky cleared up. 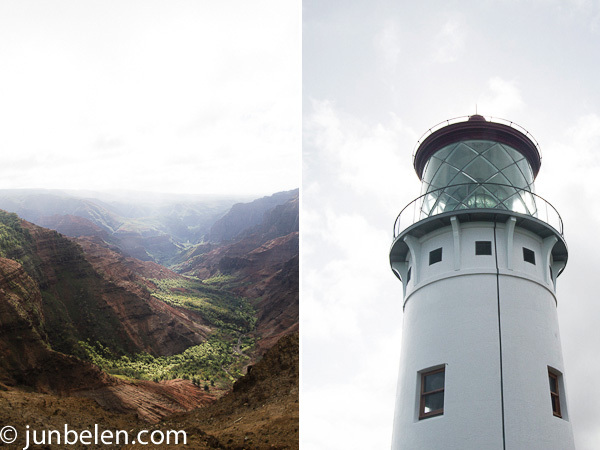 The rain trickled to a stop and a bow beamed from end to end over Waimea Canyon. We pulled over somewhere along Highway 550 to savor the scene. 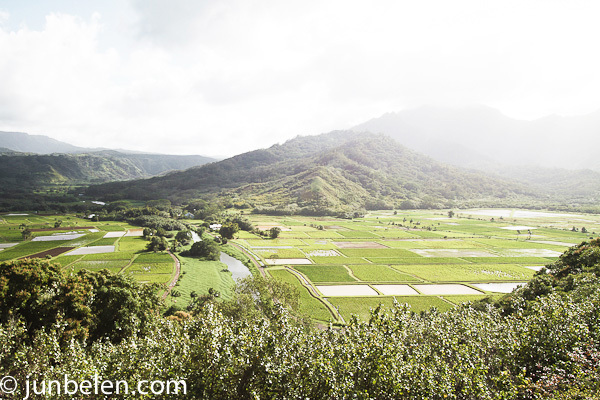 Fog continued to roll down the red, jagged slopes of the Na Pali mountains while the sea to the south surged and swelled. Kauai felt like home in so many ways. There is rain. Plenty of rain. Even more so in the North Shore where we stayed. There are chickens in the wild. Chickens out on parking lots. Chickens out on hiking trails. Chickens right on the beach, I kid you not. The rain pitter-pattered and lulled us to sleep at night while the roosters crowed and woke us up in the morning. There are rambutans in fruit stands along the roadside, papaya trees heavy with fruit in the locals’ yards and taro fields in checkerboard pattern that stretched out for miles. And there are Filipinos. Plenty of Filipinos. My kababayan — my countrymen — are everywhere, from the general store in Kilauea to the poke joint in Waimea. The best bowl of saimin noodles and the best plate lunch of Kalua pork and cabbage I had on the island were made by Filipino cooks. I was convinced that Kauai is run by Filipinos, that the entire island will shut down without them. 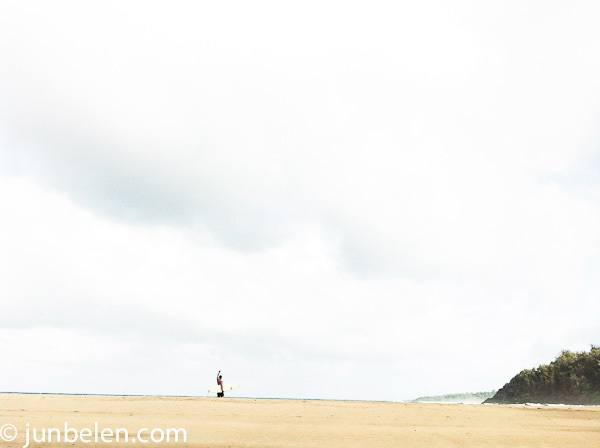 One good thing, I guess, about visiting Kauai in December is that the beaches are empty. 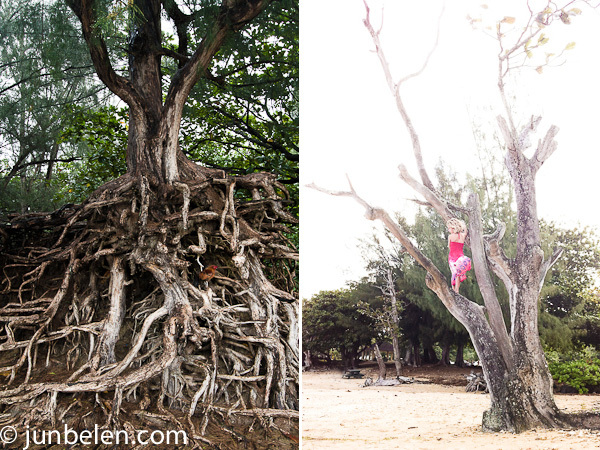 We discovered quiet Kahili in the North Shore where the Kilauea Stream opens up to the Pacific and enjoyed our solitude there immensely. If you haven’t tried swimming in the ocean in a little rain with a rainbow in the sky then you should try it. You cannot have a rainbow without a little rain, so they say. Kalua, in Hawaiian, means to cook in an imu, an earth oven. 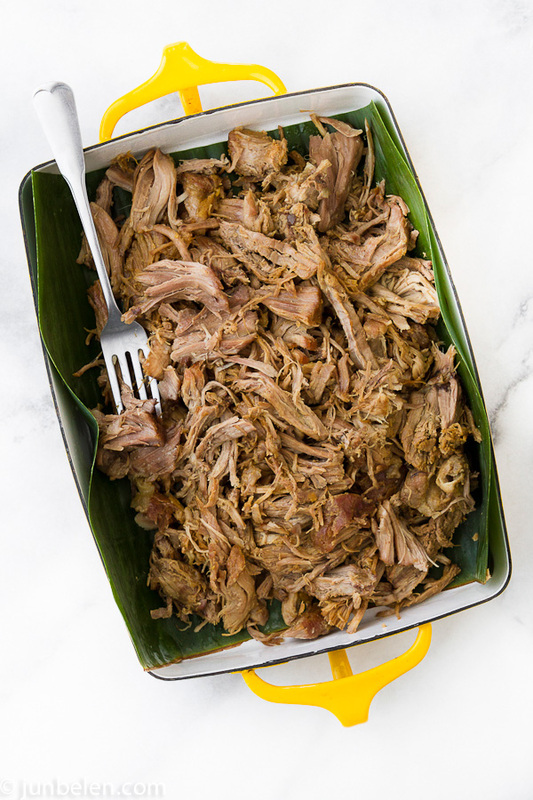 Kalua pig is a pig cooked in a pit, which is the centerpiece of many a Hawaiian feast called luau. It can be recreated at home by slowly roasting pork rubbed with sea salt and liquid smoke then wrapped in ti or banana leaves. Liquid smoke is a smoke-flavored liquid seasoning available in most grocery stores. Stir-fry Kalua pork with shredded cabbage and serve with rice and macaroni salad for a classic Hawaiian plate lunch. Fry Kalua pork with garlic, onions, and potatoes and serve as a hash with fried rice and fried eggs. Whisk together sea salt, soy sauce, garlic, ginger, and liquid smoke in a small bowl and set aside. Cut 1/4-inch-deep slits 1 inch apart all over pork roast. Rub pork with salt and soy sauce. 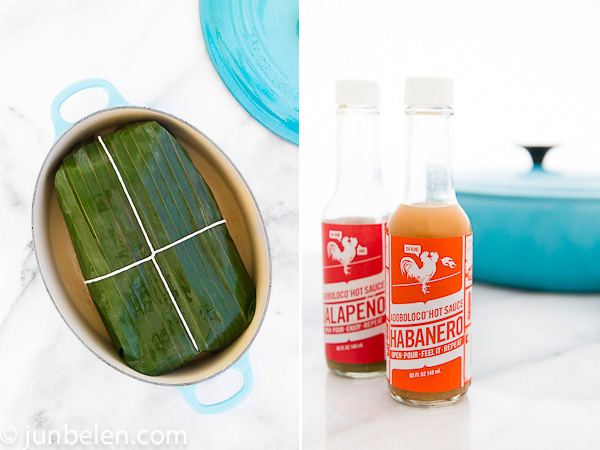 Wrap pork in banana leaves and secure with kitchen twine. Place pork in a Dutch oven or in a roasting pan. When using a pan, place a piece of foil over the top of the pork and crimp edges to the pan. Roast until meat is fork tender, about 45 minutes per pound. Remove banana leaves and kitchen twine. Shred pork with a fork and season with salt to taste. Adoboloco is Tim Parsons’ Maui-made hot sauces. 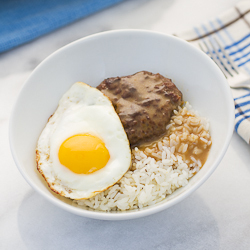 Adoboloco was inspired by his love of chicken and pork adobo. It started as a homeschooling garden project with his wife and three children. His handcrafted hot sauces are made from just four ingredients: apple cider vinegar, Hawaiian sea salt, garlic, and chili pepper — jalapeno, Thai and habanero — all organically grown in their home in Maui. 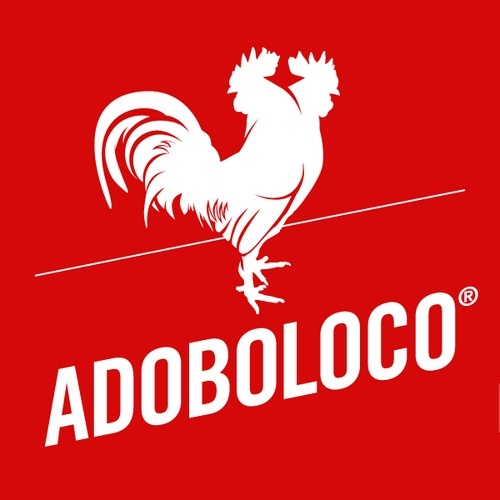 Adoboloco gives dishes like Kalua pork, pork and chicken adobo, and pretty much anything a tangy kick. Beautiful pics, Jun. I’ve always wanted to go to Hawaii. The fact that there are so many Filipinos there make it so much more appealing! Gorgeous holiday you had! I have not been to the islands in so long, and now I am itching to hit Kauai. I was there years ago, but only for a night, and we never really explored beyond the hotel. I have never been to a luau but have been to a picnic on the beach with friends who live near Oahu. I remember them bringing roasted pig that was juicy and flavorful – they also mentioned that it is served at luaus. 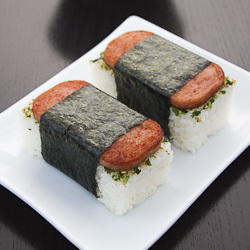 The one thing I remember them being really excited about (even more then the pig) was the macaroni salad and Spam slices. I found that comical as the pig was way better! 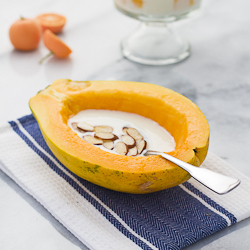 Look forward to trying your recipe! DROOL! That pork looks amazing and absolutely easy too! And I will definitely be ordering some of that Adoboloco sauce- looks fantastic. Compliments to you on the beautiful photos as well. I am very glad you and Dennis had a lovely vacation in paradise! Cheers! Thank you so much for including us here and the support with our family project. Always love your writing and photography style. You make everything look and sound so good. You are very welcome, Tim. Congrats on making your goal and best of luck to you and your family. 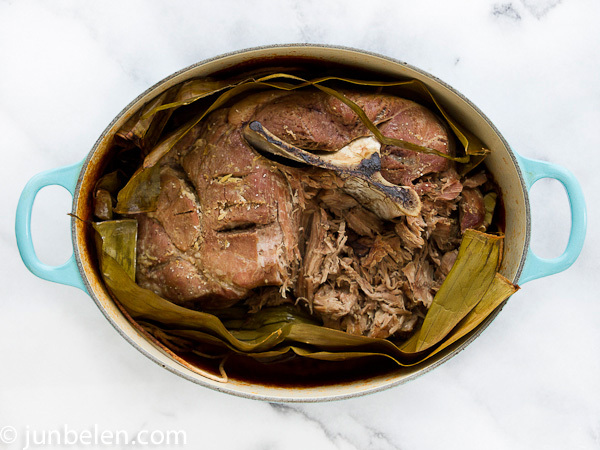 If you can’t get banana leaves *like me, then you can double wrap the pork in heavy duty foil. I’ve made this too many times to count….freezes good too.